Do You Pass on Public Land Deer? Just curious how many of you pass on shots at deer on public land. I never used to, but now I'll try to take a few doe for the freezer, and then wait for a decent buck, letting fawns,does, 18 month old and even some 2-1/2 year old bucks walk, even on public areas. Anyone else practice this kind of bastardized QDM when hunting public land? Re: Do You Pass on Public Land Deer? As a meat hunter, I'm an equal opportunity killer! Yearling doe, or an 8 point, if it's in range I'm gonna try to kill it! I went thru that selective phase where I passed up shot opportunities, waiting for something bigger. After 2 years of that, and an empty freezer, I said the heck with that. I'd much rather have meat in the freezer, than antlers on the wall. But that's just me, to each his own. I don't pass on deer I don't get that many shots so when I do I take the shot. But if people want to pass on young deer good for you that's a good thing to do. I do try to pass on smaller bucks I feel, that if I want the meat I will take a doe. How ever thing year I am deer less after passing two spikes, no does in range thus far. Its really up to the individual. No, but like Pinch Point said, it is really up to the Individual and also environment matters. Where I go, big woods, low deer numbers, you just do not have the privelage of passing something up. You may see 1 deer in 10 sits and that would be a good day. Granted, I might be setting up wrong, but I do move around to fresh sign. I wish I had Slowbo come up here to scout this out with me and just see what he comes up with. Maybe I am going at it entirely wrong and just do not even know since I hunt alone and have nobody to be another pair of eyes on the mountain with me. Sometimes it takes years and years to develop knowledge of an area and find the sweet spots that will pay off every year. Toss in the "public" and they can disappear quickly, only takes one guy hunting the wrong wind a few times to kill a great spot. Just keep going back and getting abused, that's how you learn it. Going to put my scouting to the test in a week or so, spend a few days on unfamiliar ground to shoot an in season scouting video. No, I wont be passing on deer on this hunt, it's going to be a back to basics take a shot if I get it hunt, doe, spike, 12 point, watch out! After that though, I'll probably go back to waiting for a good 'un. Can't wait to see your next videos on this new scouting and hunting Slowbow. Don't bug me out dude! I'm really nervous about this idea. I really want it to come together, and I don't want to over-think it. Going to a spot I have never set foot on before, during the peak of the hard pre-rut, and try to scout it in season, while filming, and take a deer. The wife is already pissed, I just dropped this on her out of the blue, she wasn't planning on me being away except for the weekend. We'll see how it goes. In the meantime, I'm almost finished with our next video. It's a short private land hunt, but the end is what I think you'll want to watch. I twisted Michael's arm, and he came over and filmed the making of his secret recipe Rosemary Tenderloins. The stuff is THE BOMB. You all have to give this one a try. Should have it posted to the website in a few days after I finish the edit. Stop by the website, and link through and like our facebook page and you'll be notified as soon as I post it to the site! Haha, don't worry if you take a deer or not. I'm looking forward to the video either way, deer or no deer at the end of it. I have passed plenty of deer on public OH property; looking for a big one. I just do not get it, I see pleny of 1.5 to 2.5 year old basket rack bucks. One would think that all of the one I have passed would now be shooters. Well I am sure they are........somewhere. Hey, just wanted to let everyone know I got the video, Rosemary Tenderloins posted with the venison tenderloin recipe. While it's not a Public Land hunt, I sure hope your hunting provides some meat so you can try it. It's really good!!! You can see it now for free at our website http://www.camochairproductions.com/now-playing.html be sure and give it a try, even if you have to go out and (cough) buy some tenderloins this fall. Well, my trip to the un-hunted area didn't work out so well for me. I spent a whole day scouting, filming the plan. Found a few great looking spots, fresh sign scrapes, rubs, droppings, saw a few deer. Headed in in the morning, got within fifty yards of my tree, and the woods exploded. Sounded like a heard of elephants taking off up the mountain. Spent the rest of the day in stand not seeing a thing. Got a little rain coming through, then it's back into the woods for me. See ya on the other side! I don't pass on deer as the unit I hunt is one deer only. Meaning buck, doe or fawn and right now I am still after my first. Let this 18 month old 7 point have a pass today at about 12 yards. He'll be putting in an appearance in our next video about in season scouting for deer on public land. Typically only where antler restrictions are in place. Sometimes..another thing I like about hunting public land only..no extra rules..on the National Forest I hunt anyway. We have a 4pts on one side rule where I hunt.So small bucks get a pass. 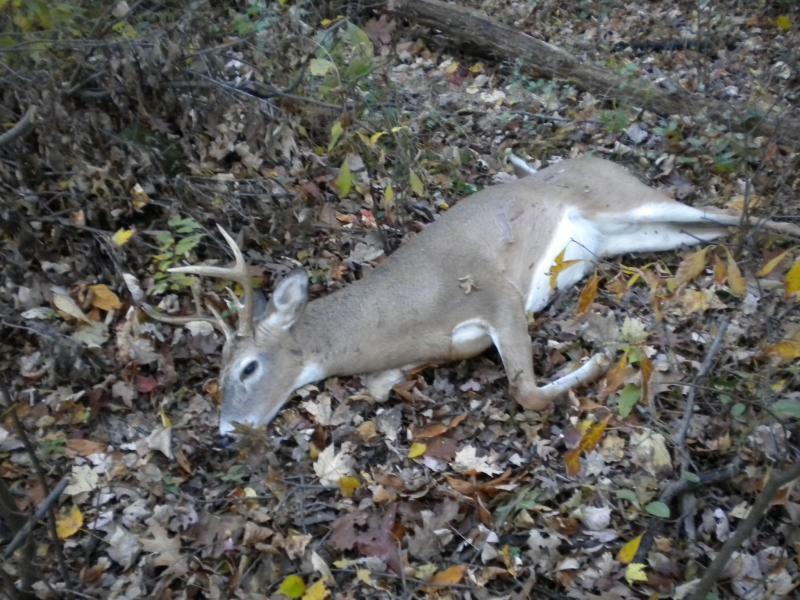 I passed this buck up a few yrs back the first day of gun season in Shawnee National Forest, Il., but when he walked up the second day I changed my mind. I used to shoot everyting that walks. Now I pass on a lot of deer. I shoot one to fill the freezer and get it out of my system early season and then I start being choosy. I do not see anything wrong with either now. I used to shoot everything but now I wait, and thought everyone should wait. I know that I do see far more deer now that I wait though. Seemed when I shot the first deer that came into range I would not see one there again for weeks. By letting them go spots tend to stay hot longer and you get a better idea of what is out there. WI has been giving out all the free doe tags you could want for a number of years in my dmu. They even went so far as to make people shoot a doe to earn a tag to shoot a buck (just to get buck only hunters to shoot does). There was two 4 day doe only gun hunts, our regular 9 day gun hunt, and a two week "holiday" gun hunt. I thought this would decimate the deer herds on the public land. I have found that it did lower it a bit on the "fringe" deer but if you are away from the parking lot there are still a ton of deer. Knowing that the dnr has tried everything to reduce the population and it is not having a much of an impact on the deer herd, I no longer worry about what people shoot. I used to walk by hunters with fawns or small bucks and think just 2 or 3 more years and that would have been a great deer. Now I stop, sincerely congratulate them, offer help dragging and count my blessings that we are able to get out and enjoy hunting together. I pass on smaller deer, and does. Seems like the deer sightings are getting a lot less. I passed every deer this season but one. Used to shoot anything that walked by,but as i became a better hunter I see more deer now and can be more choosey.One thing, I tried the video thing and got so caught up in trying to get on film the deer was out of range before I knew it. Its all in what you want to do not what someone else thinks, its your time in the woods and thats what your there for. whitetailwick wrote: I passed every deer this season but one. Used to shoot anything that walked by,but as i became a better hunter I see more deer now and can be more choosey.One thing, I tried the video thing and got so caught up in trying to get on film the deer was out of range before I knew it. Its all in what you want to do not what someone else thinks, its your time in the woods and thats what your there for.